Chorley Branch meets every 3rd Thursday at 7.30pm at Chorley Masonic Hall. We have a membership of some 160 members, with 50 - 60 regularly attending our meetings. Our members and guests are met at the door by the friendly reception team. 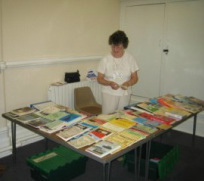 The Branch Sales stall is run by the branch for its members. The stall sells albums in which to put certificates and other memorabilia as well as the acid free inserts. At each meeting we have a speaker. Our speakers talk on a wide range of subjects all related to Family History - either directly with subjects such as Censuses or Parish Records or Civil Registration or indirectly which give a background to the lives and times of our ancestors. Our meetings give our members the opportunity to chat amongst themselves over tea and coffee to people who may have answers to their family history problems and who may be able to help break down some of their brick walls and most of all love to talk to others about their hobby. We have a Lending Library open each month which is a resource that enables members to browse and borrow books for the following month.